This TIP, Substance Abuse Among Older Adults, presents treatment providers with much-needed information about a population that is underdiagnosed and underserved. Substance abuse, particularly of alcohol and prescription drugs, often goes undetected among adults over 60 in part due to societal reasons - older adults tend to be ashamed about drinking or drug problems and see them as a moral failing. Providers, for their part, may confuse symptoms of substance use disorders with age-related changes. Because so much of older adults' substance abuse is never even identified, this TIP is aimed at not only substance abuse treatment providers but also primary care clinicians, social workers, senior center staff, and anyone else who has regular contact with older adults. The TIP discusses the relationship between aging and substance abuse and offers guidance on identifying, screening, and assessing not only substance abuse but also disorders such as dementia and delirium that can mask or mimic an alcohol or prescription drug problem. Practical accommodations to treatment for older adults and a discussion of how to assess outcomes and treat within a managed care context round out the document. Explain the prevalence of substance abuse in older American adults. Describe risk factors in older adults for substance abuse. List physical symptoms that can potentially signal the development of addiction. Identify how the physical effects of normal aging can affect the way an older person responds to alcohol or other drugs. Delineate brief interventions for substance abuse. Substance abuse, particularly of alcohol and prescription drugs, among adults 60 and older is one of the fastest growing health problems facing the country. Yet, even as the number of older adults suffering from these disorders climbs, the situation remains underestimated, underidentified, underdiagnosed, and undertreated. Until relatively recently, alcohol and prescription drug misuse, which affects up to 17 percent of older adults, was not discussed in either the substance abuse or the gerontological literature (D'Archangelo,1993; Bucholz et al., 1995; National Institute on Alcohol Abuse and Alcoholism, 1988; Minnis, 1988; Atkinson, 1987, 1990). Because of insufficient knowledge, limited research data, and hurried office visits, health care providers often overlook substance abuse and misuse among older adults. Diagnosis may be difficult because symptoms of substance abuse in older individuals sometimes mimic symptoms of other medical and behavioral disorders common among this population, such as diabetes, dementia, and depression. Often drug trials of new medications do not include older subjects, so a clinician has no way of predicting or recognizing an adverse reaction or unexpected psychoactive effect. Other factors responsible for the lack of attention to substance abuse include the current older cohort's disapproval of and shame about use and misuse of substances, along with a reluctance to seek professional help for what many in this age group consider a private matter. Many relatives of older individuals with substance use disorders, particularly their adult children, are also ashamed of the problem and choose not to address it. Ageism also contributes to the problem and to the silence: Younger adults often unconsciously assign different quality-of-life standards to older adults. Such attitudes are reflected in remarks like, "Grandmother's cocktails are the only thing that makes her happy," or "What difference does it make; he won't be around much longer anyway." There is an unspoken but pervasive assumption that it's not worth treating older adults for substance use disorders. Behavior considered a problem in younger adults does not inspire the same urgency for care among older adults. Along with the impression that alcohol or substance abuse problems cannot be successfully treated in older adults, there is the assumption that treatment for this population is a waste of health care resources. These attitudes are not only callous, they rest on misperceptions. Most older adults can and do live independently: Only 4.6 percent of adults over 65 are nursing home or personal home care residents (Altpeter et al., 1994). Furthermore, Grandmother's cocktails aren't cheering her up: Older adults who "self-medicate" with alcohol or prescription drugs are more likely to characterize themselves as lonely and to report lower life satisfaction (Hendricks et al., 1991). Older women with alcohol problems are more likely to have had a problem-drinking spouse, to have lost their spouses to death, to have experienced depression, and to have been injured in falls (Wilsnack and Wilsnack, 1995). The reality is that misuse and abuse of alcohol and other drugs take a greater toll on affected older adults than on younger adults. In addition to the psychosocial issues that are unique to older adults, aging also ushers in biomedical changes that influence the effects that alcohol and drugs have on the body. Alcohol abuse, for example, may accelerate the normal decline in physiological functioning that occurs with age (Gambert and Katsoyannis, 1995). In addition, alcohol may elevate older adults' already high risk for injury, illness, and socioeconomic decline (Tarter, 1995). It will be increasingly difficult for older adults' substance abuse to remain a hidden problem as the demographic bulge known as the Baby Boom approaches old age early in the next century. Census estimates predict that 1994's older adult population of 33 million will more than double to 80 million by 2050 (Spencer, 1989; U. S. Bureau of the Census, 1996). Most of that growth will occur between 2010 and 2030, when the number of adults over 65 will grow by an average of 2.8 percent annually (U. S. Bureau of the Census, 1996). In 1990, 13 percent of Americans were over 65; by 2030, that bloc will represent 21 percent of the population (U. S. Bureaus of the Census, 1996). The demographic increases among older adults are summarized below and in Figure 1-1. Life expectancy in the United States has increased. In 1950, it was 68 years, and by 1991, it had reached 79 years for women and 72 years for men (U. S. Bureau of the Census, 1996). Not only are adults in general living longer, substance abusers are also living longer than ever before (Gomberg, 1992b). Thus, more Americans face chronic, limiting illnesses or conditions such as arthritis, diabetes, osteoporosis, and senile dementia, becoming dependent on others for help in performing their activities of daily living (U. S. Bureau of the Census, 1996). Alcohol use was less common in the 1930s, 1940s, and 1950s than it has been since the 1960s. Many of those who are now 60 and older, influenced by prevailing cultural beliefs and Prohibition, never drank at all, and a negligible number used illicit drugs. Younger birth cohorts in this century tend to have increasingly higher rates of alcohol consumption and alcoholism (Atkinson et al., 1992). Thus, "the prevalence of alcohol problems in old age may increase, especially among women, for birth cohorts entering their 60s in the 1990s and beyond"(Atkinson and Ganzini, 1994, p. 302). A recent study in Sweden found that the male-to-female ratio among older alcohol abusers admitted for addiction treatment decreased from 7.8:1 to 3.4:1 in the span of a decade (Osterling and Berglund, 1994). Because there is a clear relationship between early alcohol problems and the development of alcohol problems in later life, drinking among older adults is likely to become an even greater problem in the near future (Rosin and Glatt, 1971; Gomberg, 1992; Zimberg, 1974; Helzer et al., 1991a; Beresford, 1995a). Liberto and colleagues concluded that the overall increase in alcohol problems throughout the population, coupled with the aging of the Baby Boomers, suggests that the number of older adults with alcohol-related problems will rise alarmingly (Liberto et al., 1992). Taken together, these factors raise the prospect of tomorrow's health services facing a "potentially preventable 'tide' of alcohol-induced morbidity" (Saunders, 1994, p. 801). Further research is needed on the physiological effects of marijuana on older adults, because many children of the 1960s can be expected to carry this habit into old age. Health care and social service providers who currently care for Americans age 60 and older will mainly encounter abuse or misuse of alcohol or prescribed drugs. Abuse of heroin and other opioids is rare, although some older adults misuse over-the-counter drugs that have a high alcohol content, such as cough suppressants. Many of these over-the-counter drugs negatively interact with other medications and alcohol. Problems stemming from alcohol consumption, including interactions of alcohol with prescribed and over-the-counter drugs, far outnumber any other substance abuse problem among older adults. Community prevalence rates range from 3 to 25 percent for "heavy alcohol use" and from 2.2 to 9.6 percent for "alcohol abuse" depending on the population sampled (Liberto et al., 1992). (Chapter 2 defines levels of use and adjusts them for older adults.) A recent study found that 15 percent of men and 12 percent of women age 60 and over treated in primary care clinics regularly drank in excess of limits recommended by the National Institute on Alcohol Abuse and Alcoholism (i.e., no more than one drink per day) (Saunders, 1994; Adams et al., 1996; National Institute on Alcohol Abuse and Alcoholism, 1995). The differences in the prevalence rates above illustrate the difficulty in identifying how widespread the current problem is. One researcher suggests that alcohol abuse among older adults is easily hidden, partly because of its similarities to other diseases common as one ages and partly because elders remind clinicians of a parent or grandparent (Beresford, 1995b). Recent studies in Australia (McInnes and Powell, 1994) and a corroboration of similar data from the United States (Curtis et al., 1989) found that clinicians recognized alcoholism in only one-third of older hospitalized patients who had the disorder. Furthermore, many of the signs and symptoms of alcohol abuse among younger populations do not apply to older adults: Most older adults are no longer in the work force, have smaller social networks, and drive less (reducing the potential for being recognized as abusing alcohol). Chapter 2 details drinking practices and problems among older adults. Identification, screening, and assessment of alcohol and drug use - specifically targeted to this population - are discussed in Chapter 4. The abuse of narcotics is rare among older adults, except for those who abused opiates in their younger years (Jinks and Raschko, 1990). Prescribed opioids are an infrequent problem as well: Only 2 to 3 percent of noninstitutionalized older adults receive prescriptions for opioid analgesics (Ray et al., 1993), and the vast majority of those do not develop dependence. One study, for example, found that only 4 of nearly 12,000 patients who were prescribed morphine for self-administration became addicted (Hill and Chapman, 1989). The use of illicit drugs is limited to a tiny group of aging criminals and long-term heroin addicts (Myers et al., 1984). Although little published information exists, Panelists report that a far greater concern for drug misuse or abuse is the large number of older adults using prescription drugs, particularly benzodiazepines, sedatives, and hypnotics, without proper physician supervision (Gomberg, 1992). Older patients are prescribed benzodiazepines more than any other age group, and North American studies demonstrate that 17 to 23 percent of drugs prescribed to older adults are benzodiazepines (D'Archangelo, 1993). The dangers associated with these prescription drugs include problematic effects due to age-related changes in drug metabolism, interactions among prescriptions, and interactions with alcohol. Unfortunately, these agents, especially those with longer half-lives, often result in unwanted side effects that influence functional capacity and cognition, which place the older person at greater risk for falling and for institutionalization (Roy and Griffin, 1990). Older users of these drugs experience more adverse effects than do younger adults, including excessive daytime sedation, ataxia, and cognitive impairment. Attention, memory, physiological arousal, and psychomotor abilities are often impaired as well (Pomara et al., 1985), and drug-related delirium or dementia may wrongly be labeled Alzheimer's disease. Misuse of psychoactive prescription drugs is discussed in Chapter 3. For the purposes of this TIP, an older adult is defined as a person age 60 or older. Any age cutoff is somewhat arbitrary because age-related changes vary tremendously across individuals and even within one person from body system to body system. An 80-year-old can have better health functioning than a 50-year-old, and a 70-year-old can have "the spine of an 80-year-old, a heart typical of a 60-year-old, and a central nervous system equal in functioning to an average 60-year-old" (Altpeter et al., 1994, p. 30). Although some recommendations in this TIP may apply more to adults 70 and older, some of the age-related changes that affect the body's reactions to alcohol and other drugs begin as early as 50. 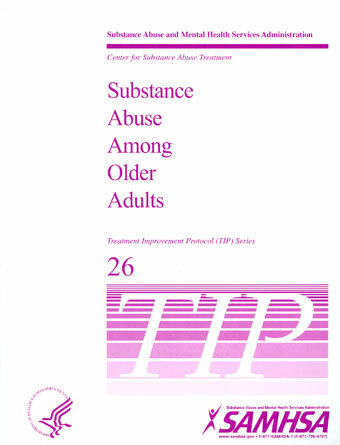 Chapter 2 examines classifications such as at-risk, problem, and dependent alcohol consumption patterns, which have been the focus of major diagnostic systems, particularly the Diagnostic and Statistical Manual of Mental Disorders, Fourth Edition (DSM-IV) ( American Psychiatric Association, 1994), and reconfigures them to suit older adults' unique responses to and experiences with alcohol and drug use. Further complicating treatment of older substance abusers is the fact that they are more likely to have undiagnosed psychiatric and medical comorbidities. According to one study, 30 percent of older alcohol abusers have a primary mood disorder (Koenig and Blazer, 1996). A thorough evaluation of all problems is essential when caring for older adults: Failure to do so will undoubtedly increase the number of false diagnoses and diminish the quality of older patients' lives (Gomberg, 1992). Physical and mental comorbidities are discussed in detail in Chapter 4. The term ageism was coined in the mid-1960s (Butler, 1969)to describe the tendency of society to assign negative stereotypes to older adults and to explain away their problems as a function of being old rather than looking for specific medical, social, or psychological causes. In American culture, ageism reflects a personal revulsion about growing old, comprising in part fear of powerlessness, uselessness, and death. Older adults often internalize such stereotypes and thus are less likely to seek out mental health and substance abuse care (Patterson and Dupree, 1994). Ageism may result in an older adult being classified as "senile," when in reality he or she may be afflicted with specific and sometimes treatable comorbid conditions such as Alzheimer's disease, depression, multi-infarct dementia, and alcoholism. Not only is a younger adult with comorbid conditions more likely to receive a correct diagnosis for substance abuse, but a younger patient diagnosed with, say, hypertension, will more likely be examined for underlying etiologies, including substance abuse. With older adults, providers often do not look beyond the presenting problem for which the patient is seeking care (Curtis et al., 1989). Despite caregivers' good intentions, instances of ageism also occur in congregate meal settings and in the provision of homemaker services to the homebound. Changes in eating habits, for example, may not be explored because "older people get fussy about their food." Confusion in older adults may go unchallenged because home health aides attribute it to "a bad night" or age-related "spaciness." Older patients are significantly less likely to have substance abuse problems identified during routine medical care. If a diagnosis of substance abuse is made, an older patient is less likely to have treatment recommended (Curtis et al., 1989). Ageism is reflected in some providers' belief that older adults' quality of life will remain poor even if they are successfully treated for their substance abuse. Such lowered expectations may also be compounded by "therapeutic nihilism": Older substance abusers may be deemed not worthy of the effort involved in treating or changing behavior because "they are likely to die soon anyway." A second barrier to treatment is a lack of awareness of the problem that is often shared by the older substance abuser, his or her loved ones, the community, and society as a whole. A lack of awareness or denial of the signs of alcohol abuse (more common among older adults), combined with the personal or community-specific stigma of the disease, may effectively raise one or more barriers to treatment. Stigma, shame, or denial associated with substance abuse may be related to generation, religion, gender, culture, or a combination of these and other factors. Many older adults formed their attitudes about alcohol before the 1950s, when advertising and wider accessibility helped change the use of alcohol from a moral failing to an accoutrement of postwar prosperity. If adults attribute their alcohol problems to a breakdown in morals, they are not likely to seek substance abuse treatment. Many older adults are also very sensitive to the stigma associated with psychiatric disorders. They are much more willing to accept a medical diagnosis than a mental or psychiatric one, and they may translate this bias into a reluctance to describe mood disturbances or to acknowledge symptoms that might be interpreted as manifestations of weakness, irresponsibility, or "craziness." They may genuinely think many problems are simply related to old age or be reluctant to complain too much (Weiss, 1994). In addition, many older adults do not accept that alcohol- or other drug-related disorders are health care problems or diseases. It may be difficult for other adults to conceive of an older person, especially a woman, as having problems with alcohol or other substances. This particular limitation can be true of an alcohol abuser's daughter or of an entire community, which may have decided that alcoholism is a youth problem. Drinking among older adults is often perceived as a pleasure they have earned and, lacking work and family responsibilities, should be allowed to enjoy: Because social drinking is an acceptable behavior, it can serve to mask a more serious drinking problem. Health care and older adult service providers may be as slow to spot a substance abuse problem as everyone else is: Despite its frequency, there is often a low index of suspicion for this problem. Even when there is the suspicion of a substance abuse disorder, the practitioner may have difficulty applying the diagnostic criteria to a wide variety of nonspecific symptoms. With a younger patient, serious physical problems (e.g., heart disease, diabetes) can be more easily ruled out, leading quickly to a diagnosis of substance abuse in the presence of certain symptoms. With an older patient, health care providers are often in a quandary - symptoms such as fatigue, irritability, insomnia, chronic pain, or impotence may be produced or influenced by substance abuse, common medical and mental disorders, or a combination of these conditions. Another clinician barrier to diagnosing alcohol problems in older adults is stereotyping. Clinicians are less likely to detect alcohol problems in women, the educated, and those with higher socioeconomic status (Moore et al., 1989). Other barriers related to clinician behavior are noted in the literature. Keeler and colleagues studied the effect of patient age and length of physician encounter. They found that the amount of time physicians spend with a patient decreases as the age of the patient increases (Keeler et al., 1982). (Obviously, this is not due to older patients' having fewer medical complaints.) It is unlikely that abbreviated office visits are sufficient to identify an older adult's underlying problem with alcoholism. Not only do the physician encounters become shorter, but problems related to alcohol and drugs increasingly compete for discussion time against other health problems. During a short office visit, there are many topics to cover in patient-provider discourse, ranging from renewal of multiple prescriptions to the impact of the death of a spouse. Substance abuse often ends up at the bottom of the list or is not considered at all when a patient presents with many medical or personal problems. Providers, older patients, and family members typically place higher priority on physical conditions such as heart problems and renal failure than on alcohol abuse. Providers may also believe that older substance abusers do not benefit from treatment as much as younger patients, despite studies that have dispelled this persistent myth. Research indicates that, compared with younger patients, older adults are more likely to complete treatment (Linn, 1978; Cartensen et al., 1985) and have outcomes that are as good as or better than those of younger adults (Kashner et al., 1992; Atkinson, 1995; in press). Yet health care providers still need more education about substance abuse treatment options and success rates (see Chapter 6). Clinicians may not know that certain drugs are habit-forming or about specific drug interactions and side effects. One diagnostic barrier is that many physicians believe alcoholics must be heavy drinkers and often miss the opportunity to intervene because their definition of problem drinking rests on amounts and frequencies that do not apply to older adults (see Chapter 2). Those treating older substance abusers should receive training on drug-to-drug interaction, drug-to-disease interaction, drug-to-alcohol interaction, and alcohol-to-disease interaction (discussed in Chapters 2 and 3). Medical and psychiatric comorbidities present yet another challenge to the effective treatment of the older substance abuser. Comorbid conditions such as medical complications, cognitive impairment, mental disorders such as major depression, sensory deficits, and lack of mobility not only can complicate a diagnosis but can sway the provider from encouraging older patients to pursue treatment for their substance abuse problems. For example, older patients who cannot walk up stairs or drive after dark may not be encouraged to attend evening Alcoholics Anonymous (AA) meetings. Older patients may also be screened out of treatment programs because of poor cognitive tests or simply because health professionals do not think they will benefit. In addition, treatment programs may be reluctant to accept them or may not have the facilities to accommodate their special needs. Comorbid depression and anxiety pose other barriers. Although inpatient psychiatric hospitals generally have staff trained to treat dually diagnosed patients, outpatient programs may not. These programs may not accept medicated older adults with mental disorders. Women, minorities, and those who are homebound, including adults with physical disabilities, confront more specific barriers to treatment. Compared with men, women have less insurance coverage and supplemental income (such as a pension). Women are less likely to have worked, more likely to lose insurance coverage with the death of a spouse, and more likely to live in poverty. Women drink less often in public places and are therefore less likely to drive while intoxicated or engage in other behaviors that might reveal an alcohol problem. Many older women never learned to drive, and they are more likely to live at home alone. Overall, women are healthier and more independent but are also more isolated. They often drink alone. Older women are prescribed more and consume more psychoactive drugs, particularly benzodiazepines, than are men and are more likely to be long-term users of these substances (Gomberg, 1995). Although little research has been done on older minority populations, the Panelists agreed that older minority individuals also face barriers to treatment. Recent data suggest that older members of minority groups, particularly African-Americans, may be more vulnerable to late-life drinking than previously thought (Gomberg, 1995). For many older minority adults in urban areas, health care is delivered in busy hospital outpatient departments or in emergency rooms. These settings further diminish the likelihood that alcohol and other drug issues will be addressed. Language is another major issue in identifying and treating substance abuse among minority elders because many of them were first-generation immigrants who never learned English. In order to access services, these patients need an interpreter or a family member who can serve as an interpreter. This raises an additional issue: Interpreters can bias communications, adding yet another barrier to effective treatment. Non-English-speaking minorities have also been at a disadvantage in treatment and therapy in many areas of the country. Cultural competence is crucial when the treatment provider has a different ethnic or cultural background than the client. The clinician needs some knowledge of the belief systems of the client to effectively interview and interpret responses from, for example, Native Americans. Although some progress has been made in providing culturally appropriate prevention and treatment programs for the Hispanic population, much less is available for other cultural or linguistic minorities, such as Eastern Europeans and Asians. The barriers that prevent identification and treatment of substance abuse among all older adults are even greater for the homebound, particularly comorbidities, transportation and handicapped accessibility, isolation, and gender (over 70 percent of home care patients are women [Dey, 1996]). Older adults are often restricted to their homes by an array of health problems that limit their mobility. Heart disease, diabetes, chronic lung diseases, and other conditions diminish older adults' ability to perform the basic activities of daily living, making it less likely they will seek treatment for their substance problems. Adults bound to their homes by physical disabilities are at particularly high risk for alcoholism. The weakness and frail physical condition of many homebound older adults also limit mobility and transportation options beyond the problems faced by older adults in general. By definition, homebound older adults cannot get out of their homes without "considerable and taxing effort" and almost always require the assistance of another person (Health Care Financing Administration, 1997). In practical terms, this means these older adults cannot drive or take public transportation, taxicabs, or rides from friends who are also frail. They must depend on able-bodied others, who they may not want to bother in nonemergency situations. Such dependency can be embarrassing and depressing, which may trigger alcohol or drug use. Finally, homebound older adults are often very isolated socially. Limited contacts with others may allow serious abuse to go undetected. Lack of a social support network makes these older adults even more susceptible to depression and despair. Transportation (may be available to go to a hospital but not to AA or aftercare or evening programs): This is especially problematic in rural communities that lack public transportation or in poor urban communities where accessing transportation can be dangerous (Fortney et al., 1995). Shrinking social support network: Fewer friends to support them, participate in the treatment process, or take them places. Time: Despite the assumption that older adults have an excess of free time, they may well have to provide 24-hour supervision to a spouse, other relative, or friend, or have to care for grandchildren while the parent works. Lack of expertise: Few programs have specialists in geriatrics, treat many older adults, or are designed to accommodate functional disabilities such as hearing loss or ambulation problems. Financial: The structure of insurance policies can be a barrier to treatment. The carving out of mental health services from physical health services under managed care in particular can prevent older adults from receiving inpatient substance abuse treatment. Because of the increased potential for enhanced reactions to alcohol and to alcohol in combination with other drugs, it is important that clinicians, family members, and social service providers be on the lookout for signs of problems. Communities can implement "gatekeeper" systems, wherein meter readers, credit office workers, repair personnel, postal carriers, police, apartment managers, and others watch for and report signs of depression and other psychiatric disorders (often exacerbated by substance abuse) (see Chapter 4). Suggestions for who can help move older adults into treatment and various treatment approaches are discussed in Chapter 5. Given the scope of the problem, the literature on substance abuse problems among older adults is surprisingly sketchy. Substance abuse among older adults as a distinct subgroup with definable characteristics was first described in the research literature in 1964 (Droller, 1964). Researchers in the 1960s and 1970s were convinced that substance abuse was rare among older adults (Atkinson and Ganzini, 1994). Thus, researchers and clinicians alike widely believed that substance use disorders among this age group did not merit the attention given to drinking and drug abuse among younger adults (Bucholz et al., 1995). Most professional service providers thought that lifelong alcohol- and other drug-addicted individuals either died early or recovered spontaneously, "maturing out" of their problems (Saunders, 1994; Vaillant et al., 1983). Older drinkers tended to be viewed "merely as survivors of a long, dissolute history of heavy alcohol use followed by predictably poor health and early demise" (Beresford, 1995b, p. 3), and alcoholism was considered predominantly a male problem, affecting four males for every female (Bucholz et al., 1995). Therefore, the typical older adult with a drinking problem was considered most often to be a man with a long history of drinking. Even as recently as 1987, the Diagnostic and Statistical Manual of Mental Disorders, Third Edition, Revised (DSM-III-R), the standard diagnostic manual the American Psychiatric Association used at that time, stated, "In males, symptoms of alcohol dependence or abuse rarely occur for the first time after age 45" ( American Psychiatric Association, 1987, p. 174). The last decade has seen as much research as the 35 years preceding, and many misperceptions have been corrected. Yet the problem remains elusive even as it grows. Many Americans who are now young or middle-aged will carry their use and abuse of alcohol and other drugs with them into old age - and they will also live longer. Life expectancy jumped almost 30 years between 1900 and 1989, and it continues to climb. By the year 2050, one out of four Americans over age 65 will be 85 and older (U.S. Bureau of the Census, 1996). Substance use disorders, if not diagnosed and treated, may ruin the last stage of life for countless Americans. This TIP illuminates this invisible epidemic and advises how to treat it, combining the best of the existing literature with the years of the Consensus Panelists' experience in researching and treating older substance abusers. The Panel aims to advance the understanding of the relationships between aging and substance abuse and to provide practical recommendations for incorporating that understanding into practice.